New York Times bestselling author Douglas Adams and zoologist Mark Carwardine take off around the world in search of exotic, endangered creatures. Join them as they encounter the animal kingdom in its stunning beauty, astonishing variety, and imminent peril: the giant Komodo dragon of Indonesia, the helpless but loveable Kakapo of New Zealand, the blind river dolphins of China, the white rhinos of Zaire, the rare birds of Mauritius island in the Indian Ocean. 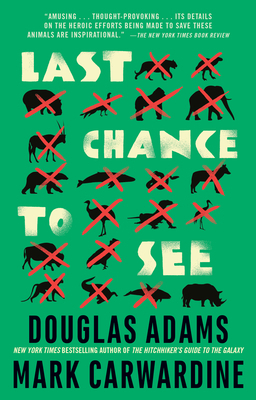 Hilarious and poignant—as only Douglas Adams can be—Last Chance to See is an entertaining and arresting odyssey through the Earth’s magnificent wildlife galaxy. Douglas Adams was born in 1952 and educated at Cambridge. He was the author of five books in the Hitchhiker’s Trilogy, including The Hitchhiker’s Guide to the Galaxy; The Restaurant at the End of the Universe; Life, the Universe and Everything; So Long, and Thanks for All the Fish; and Mostly Harmless. His other works include Dirk Gently’s Holistic Detective Agency; The Long Dark Tea-Time of the Soul; The Meaning of Liff and The Deeper Meaning of Liff (with John Lloyd); and Last Chance to See (with Mark Carwardine). His last book was the bestselling collection, The Salmon of Doubt, published posthumously in May 2002. Mark Carwardine is a zoologist, an outspoken conservationist, an award-winning writer, a BBC radio and TV presenter, a widely published wildlife photographer, a bestselling author, a wildlife tour operator and leader, a lecturer, and a magazine columnist. He co-presented the popular BBC TV series Last Chance to See with actor and comedian Stephen Fry, in which the unlikely duo followed in the footsteps of Carwardine’s original travels with Douglas Adams. Carwardine has written more than fifty books, including Field Guide to Whales, Dolphins and Porpoises; Mark Carwardine’s Guide to Whale Watching in North America; Mark Carwardine’s Guide to Whale Watching in Britain and Europe; Extreme Nature; The Guinness Book of Animal Records; Mark Carwardine’s Ultimate Wildlife Experiences; The Shark-Watcher’s Handbook; and On the Trail of the Whale.